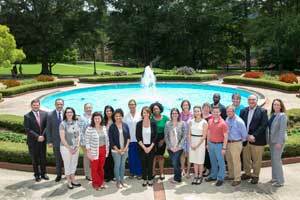 Cumberland School of Law welcomed its first cohort for the new Master of Science in Health Law and Policy (MSHLP) degree at an on-campus orientation August 21 and 22. Students had the opportunity to meet program faculty and administration, as well as spend time with fellow students. Health-care professionals from the Birmingham area also joined the group to share their expertise and answer questions. The degree will be the first fully online program offered by the law school, as well as its first degree program for nonlawyers. With input from health law and compliance experts both on campus and in the community, Cumberland School of Law was able to develop a curriculum that could earn accreditation from the Compliance Certification Board® (CCB). Samford University earned that accreditation and is one of only eight universities nationally to be accredited by the CCB. This accreditation will enable students to sit for one of four credentialing exams offered by that organization upon graduation. Experienced faculty from Samford’s Cumberland School of Law and College of Health Sciences, as well as compliance professionals from the community, will participate in the program. The program includes coursework in health law, regulatory affairs, public policy, insurance and health-care administration, with a particular emphasis on health-care compliance. The online program takes two years to complete, with students completing two classes per term through fall, spring and summer of their first year. The second year includes two classes in fall and in spring, and a final summer course. Two or three on-campus weekends are planned.